Air Canada has three direct flights to Costa Rica per week to Juan Santamaria International airport. All flights originate in Toronto, departing in the morning and arriving in San Jose in the afternoon. 150 meters north of the Aurola Holiday Inn in downtown San Jose. The charge is $50 (plus tax) and it applies per surfboard on one-way flights, and for each way of travel on round-trip or multi-segment flights. Max length 6’6 ft (203 cm). France's largest carrier offers service to and from Costa Rica via connections in Caracas Venezuela with TACA, via Mexico City with , and via Houston with Continental Airlines. The Air France offices in San José are open Monday through Friday from 8 a.m. to 12m and from 1 p.m to 5 p.m.
– €55 ($67) on flights departing from a country outside the Europe,zone 1. – €55 ($67) on flights departing from a country outside the Europe, zone 2. – €100 ($121) on flights departing from a country within the Europe, zone 3. – €100 ($121) on flights departing from a country within the Europe, zone 4. Italy's largest airline, Alitalia offers service to Costa Rica via connection through Caracas with TACA or COPA, or via New York with Continental Airlines. Alitalia's offices are open Monday through Friday from 9 a.m. to 12:30 p.m., and from 1:30p.m. to 5 p.m.
﻿American Airlines has daily flights from Dallas/Ft. Worth, and three flights per week from Miami to Juan Santamaria International airport in San Jose, Costa Rica. They also fly Tuesday through Thursday from Miami to Liberia, (Daniel Oduber airport) and from Dallas Fort Worth to Liberia on Wednesdays and Saturdays. $150 fee regardless of the number of checked bags. Lightweight surfboards packaged in a single bag that weighs less than 70 lbs. and will be accepted as a single surfboard for charging purposes. ﻿﻿British Airways ﻿does not have direct flights to Costa Rica, but does offer connections via the United States with United Airlines and other carriers. British Airways does not maintain offices in Costa Rica. Continental has daily flights each week from Houston to San Jose and one flight per week from Houston to the Liberia airport. They also have one flight each week from Newark to San Jose and Newark to Liberia respectively. Office hours are Monday through Friday, 8 am to 6 pm, and Saturday from 9 am to 1 pm. Oficentro La Virgen, Ofic #2, Zone Industrial, Pavas, San José. COPA Airlines is the national airline of Panama and offers flights throughout the region, including Central America, South America, the Caribbean and North America. The only direct flights to Costa Rica originate in Panama. Surfboards or surfboard bags measuring more than 9’5 ft (292 cm) in length will not be accepted as checked baggage on Copa Airlines flights. Bags containing surfboards weighing more than 70 lb (32 kg) will not be accepted as checked bags. San José,Costa Rica Torre Mercedes, Paseo Colón, first floor. Cubana is the official State airline of Cuba. There are two flights per week from Havana to San Jose, Costa Rica via Guatemala. Delta airlines has two flights daily from Atlanta Georgia to San Jose, Costa Rica. It also has one flight per week from Atlanta to Liberia. Office hours are Monday to Friday 8am to 5pm. Paseo Colón, 100 meters east and 50 meters south from the Toyota Building. Denver based Frontier Airlines offers regular service from Denver to San Jose, Costa Rica. checked in lieu of one of your checked bags. confirm packing regulations and fees. TACA is Central America's largest regional airline serving a number of destinations in North, Central and South America. TACA offers direct flights to a number of cities in the US and via it's partners can get you almost anywhere you want to go. San José,Costa Rica Northeast corner of the La Sabana Park, San José. • Direct flights to Costa Rica from: Madrid, four days a week. Iberia is Spains largest airline and is the only airline offering non-stop flights to Europe. Surfboards will always be treated as excess baggage with a fixed charge of €150 per leg, payable exclusively at the airport. * Trips originating in America, Nigeria or Israel, the charge will be $150. *For flights coming in and out of Brazil, Surf equipment is not included under the baggage allowance and involves a charge of $60. San José,Costa Rica Paseo Colón and Calle 40, Edif. San Jorge. San José,Costa Rica 150 mts west of the Contraloria General Building in Sabana Sur, Edificio Edicol, First Floor. • Direct flights to Costa Rica from: None - via airline partners they can connect you through major cities in the US. Lufthansa is based in Cologne. Its main base and primary traffic hub is at Frankfurt International Airport in Frankfurt am Main with a second hub at Munich. There are no direct flights to Costa Rica by Lufthansa. If you wish to use this airline for part of your travel you may fly into Miami, New York, Dallas, Houston or Atlanta and from there catch a direct flight on another carrier. In Costa Rica, Lufthansa is represented by Ambos Mares in Barrio Amon. Each year, close to two million people head off from the Netherlands to sunnier climates on board Martinair aircraft. One of these destinations is Costa Rica, via Miami or Orlando. The carier has 6 flights per week into San Jose and is a great low cost carrier to consider for flying to Europe or Florida. To and from Miami: Tuesdays, Wednesdays and Saturdays To and from Orlando: Mondays, Thursdays and Fridays. Mexicana has daily flights from Mexico City to San Jose. It has the most modern fleet in the world (6.3 years on average). It also has one of the highest on time performance levels with a 90% reliability rate. Surfboard Fee: $75 One-way per bag, Max 8’3 ft. Spirit Airlines has named itself the Ultra Low Cost Carrier. 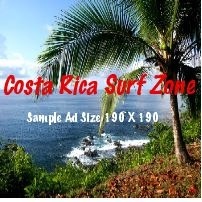 They offer low cost direct flights daily to Costa Rica from Orlando, Florida. Their theatre of operations includes the US, Latin America and the Caribbean. United airlines has regular flights to Costa Rica from Los Angeles into Juan Santamaria International airport. Their main hub is Los Angeles (LAX) from which they offer connecting flights to all parts of the US. Their San Pedro offices are open Monday through Friday, 8am to 5pm. United Airlines will accept one surfboard or one surfboard bag containing up to four boards per customer as checked baggage, weighing 50 pounds or less for a service charge fee of $100 (each way) for travel between the U.S., Canada, Puerto Rico and the U.S. Virgin Islands, and $200 (each way) for all other travel. This service charge is in addition to any excess and overweight baggage charges that may apply. ** Boards and board bags combined weighing more than 99.9 pounds (45.3 kg) will not be accepted as checked baggage. The fin must be removed or well-padded. The entire board must be encased in a suitable container to avoid scratching. United is not liable for damages. Excess valuation cannot be purchased for a surfboard. Surfboards will be accepted as checked baggage for a charge of $200 per direction. One item of surfing equipment consists of 1 surfboard. When packaging a surfboard, keels and/or kedges must be removed or crated in such a manner so as to prevent damage to other baggage. Surfboards will be accepted on US Airways Express flights. Acceptance may be restricted by length on some aircraft. A US Airways Reservation agent can provide additional information.